"Max Bachman's Lincolns," a 2,000-word article accepted by Illinois Heritage, the full-color magazine of the Illinois State Historical Society. Max Bachman (1862--1921) was an architectural stone carver and sculptor of Abraham Lincoln busts and statues. More information at http://findinglincolnillinois.com/logancocourthousehistoricarea.html#bachman. Most of the research completed and first draft begun for a book titled The Peculiar Lincoln Heritage of His First Namesake Town: A New Model for Writing a Community's Social-Cultural History. Research on the sources that influenced the development of Abraham Lincoln's rhetoric, including classical and 19th-century rhetoric. Research and development of an online, multimedia community history of the first Lincoln namesake town, including the use of 8mm film converted to Web video, for example, this amateur documentary film from 1952. Publication of this online community history on CD-ROM for distribution to numerous public and private university libraries in the Midwest, including the new Abraham Lincoln Presidential Library, which subsumes the former Illinois State Historical Library. 1. "Lincoln at Lincoln: Abraham Lincoln Rallies Logan County, Illinois, in His First Namesake Town on October 16, 1858" (the day after the last Lincoln-Douglas debate in Alton, Illinois), the Lincoln Bicentennial issue of the Journal of the Illinois State Historical Society (refereed) (101, 3--4 fall/winter, 2009: 356--392). This 13,500-word article describes the research used to create a one-act play about one of Abraham Lincoln's political rallies and stump speeches, and the play was written for the Abraham Lincoln Bicentennial Commission of Lincoln, Illinois, for its re-enactment of this historic event on October 16, 2008 (the sesquicentennial anniversary of this rally-speech). The play was a challenge to create because no full text of one of Lincoln's stump speeches has over been found, and newspaper accounts of those kinds of speeches tend to be brief. The play re-enactment is part of the Illinois bicentennial celebration of the birth of Abraham Lincoln. More information about this historical play is available at http:///findinglincolnillinois.com/abes200th-lincolnil.html. The play was performed on schedule, with wonderful October weather, and a slideshow of the production is available at http://picasaweb.google.com/Hensonphotofeast/1858LincolnILRallySpeechReEnactment101608#. Access Henson's review of this special Lincoln Bicentennial issue of the JISHS as well as sample pages of this issue. 2. "Lincoln at 100 at Lincoln: The Abraham Lincoln Centennial Celebration (1909) in His First Namesake Town" (2009). A study of the planners, honorees, other special guests, and speakers at this event provides insight into the social structure, local Abraham Lincoln heritage, and other cultural elements of this small Midwestern town at the beginning of the 20th century. 3. "Peeking Behind the Wizard's Screen: William Maxwell's Literary Art as Revealed by a Study of the Black Characters in Billie Dyer and Other Stories" (2007). A critical examination of the black characters in Maxwell's last book, with emphasis on the limitations of his sources and character portrayal. Full text at http://findinglincolnillinois.com/ross-dyer-brummell.html. 4. Review of Burkhardt, Barbara. William Maxwell: A Literary Life. Champaign, IL: The University of Illinois Press, 2005. Invited by the Journal of Illinois History, a refereed publication of the Illinois Historic Preservation Agency, Springfield, IL. Review published in the spring, 2006, issue (Vol. 9, No. 1: 72--74). Access review at http://findinglincolnillinois.com/williammaxwellreview.html. 5. "Social Consciousness in William Maxwell's Writings Based on Lincoln, Illinois." Journal of the Illinois State Historical Society (refereed) (98.4, winter, 2005/2006: 254--286). 13,000 words, 36 sources, including analysis of 16 primary sources of William Maxwell based on Lincoln, Illinois: 11 short stories, 4 novels, and a nonfiction book of family history. Summary of article at http://findinglincolnillinois.com/wmmaxwellsocialclasses.html. · Applies the author's secondary field of literature to distinguish between William Maxwell's treatment of twentieth-century Midwestern small-town life and corresponding portrayals seen in the works of Sherwood Anderson and Sinclair Lewis. · Explains that Midwestern small-town social stratification traces to agrarian origins. · Provides insight into the interrelationships among upper-, central-, and lower middle class levels of small-town Midwestern society and argues that Maxwell's depiction complements the work of other writers whose focus was on urban society. · Advances Missouri State University's public affairs mission by contributing to our knowledge of twentieth-century American society and culture. Note: William Maxwell (1908--2000), a native of Lincoln, Illinois, was a fiction editor of The New Yorker magazine for forty years (1936--1976), working with such major writers as Harold Brodkey, John Cheever, Frank O'Connor, John O'Hara, Mavis Gallant, John Updike, and Eudora Welty. Maxwell was also an author whose novel titled So Long, See You Tomorrow won the American Book Award and the Howells Medal of the American Academy of Arts and Letters. · Advances Missouri State University's public affairs mission by using the author's secondary field of the pedagogy of literature to advocate and explain a strategy for engaging students in the study of their local communities' social history and culture. 7. "Using the Internet as a Tool for Public Service: Creating a Community History Web Site." Journal of Technical Writing and Communication 35.1 (2005): 71-94. (refereed). 10,000 words, 37 sources (abstract). · Advances the University's public affairs mission by advocating academic public service-- developing community history Web sites to educate, foster civic pride, and increase heritage tourism--to the technical writing profession (scholars, instructors, students, and practitioners). 8. Mr. Lincoln, Route 66, & Other Highlights of Lincoln, Illinois (first published in 2003, continually expanded and refined) <http://findinglincolnillinois.com/>. A book-length, innovative community history Web site created as a "distance" academic public service project in support of the University's public affairs mission. By January, 2006, the homepage of this Web site had received more than 22,000 hits. This homepage explains the site's purposes of educating viewers, strengthening civic pride, and increasing heritage tourism. Refereed and in 2004 awarded "Best Web Site of the Year" by the Illinois State Historical Society (ISHS) for "superior achievement: serves as a model for the profession and reaches a greater public." The ISHS is a non-profit organization whose 2,500 members include professional historians, educators, students, libraries, and museums. The ISHS publishes the Journal of the Illinois State Historical Society, devoted to formal scholarship (refereed) (ISHS brochure). <http://www.historyillinois.org/>. 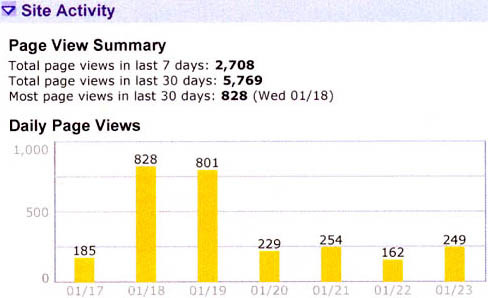 This graph indicates the highest number of hits were for days in the middle of the week: Tuesday, 1-18, and Wednesday, 1-19; and this spiked cluster of hits suggests that teachers may be directing their students to this site in computer classrooms. In that case, these statistics show that the community history Web site of Lincoln, Illinois, is succeeding in one of its primary purposes: to educate. · Applies knowledge and skill from the author's primary field of professional/technical writing as well as research expertise toward extensive community service. · Discusses both positive and negative aspects of this typical Midwestern small town, including racism. Combines published history and literature, published and original photos, vintage picture postcards, published and original maps, and collective memoir. Equivalent to approximately 1,000 printed pages with more than 1,200 images. Research was begun in 2002, and the site was launched July 4, 2003, with continual expansion/refinement through the present. · Uses more than 100 secondary sources and dozens of primary sources, including award-winning Author William Maxwell’s, Robert Wilson’s, and Illinois Appellate Court Justice James A. Knecht's literary works based on Lincoln, Illinois, and collective memoir developed by using research on the Web to identify prospective contributors and email to solicit their involvement. · Demonstrates skill in visual design for both online presentation and hard-copy printout. · Exemplifies knowledge and skill in coordinating verbal and visual content for esthetic appeal and good readability. · Demonstrates software skill in creating such graphics as maps and editing JPEGs and GIFs. · Shows the author's diverse writing skill: analysis and interpretation of historical and literary sources combined with memoir the author wrote specifically for this project to tell about growing up in Lincoln, Illinois, including anecdotes of personal experience at historic sites associated with Abraham Lincoln. · Benefits from the author's business writing skill to obtain permission to re-publish photos and the creative writing of William Childress, James A. Knecht, and Robert Wilson. · Shows skill in writing for specialized and popular reading audiences: some material is geared for professional historians, specialists in literature, and students; other material, such as memoir, appeals to a general reading audience. · Demonstrates computer and Internet skill in Web site publication and promotion. Site coded to optimize search engine and directory hits. This site consistently ranks among the top ten hits (among tens of thousands) generated by searching Google and Yahoo! with such keywords as "Lincoln, Illinois" and "'Abraham Lincoln' and 'Illinois.'" By November, 2004, the homepage had registered more than 10,000 hits. · Applies the author's promotional writing skill for effective publicity: press releases and fliers have resulted in feature articles in newspapers (online and printed): the Lincoln Courier, LincolnDai­lyNews.com, and the Peoria Journal Star. Major Web site resources for research on Abraham Lincoln carry links to this Lincoln, Illinois, community history Web site: Abraham Lincoln.org and The Abraham Lincoln Research Site. 10. “Technical Communication and Service Learning: Goals and Guidelines.” Society for Technical Communication 45th Annual Conference 1998 Proceedings. Arlington, VA: STC, 1998: 44–46. (with Dr. Kristene Sutliff: 50% hers, 50% mine). · These preceding two publications on service learning have been widely cited in print and online sources, including bibliographies of major professional associations: The Association of Teachers of Technical Writing, The National Council of Teachers of English, and The Society for Technical Communication. 11. “Why and How to Advance Technical Copywriting.” Journal of Technical Writing and Communication 26.2 (1996): 193–209. (refereed). 12. Unsolicited review of Writing High-Tech Copy That Sells. Janice M. King. New York: John Wiley & Sons, Inc., 1995. In Technical Communication Quarterly 4.4 (fall, 1995): 432–433. (unsolicited reviews ordinarily not accepted). 13. “A Preliminary Rhetoric of Technical Copywriting.” Technical Communication 41.3 (1994): 447–455. (refereed). (This article was the only source cited in an introduction to a special section on marketing communication published in the May, 1995, issue of Technical Communication.). 14. “Preparing Students to Write in Major-Field Courses: A Faculty Questionnaire for Data-Based Instructional Design.” Technical Writing Teacher (Winter, 1987): 108–110. (ref­ereed). 15. “Using Original Surveys to Promote Thinking in Library Research Projects.” Illinois English Bulletin 73.3 (1986): 20–26. (refereed). 16. “Discovering Theme Through Writing: A Response-Oriented Approach to ‘The Lottery’.” Illinois English Bulletin 72.3 (1985): 30–38. (refereed). (This issue of the IEB has been offered as a publication of the National Council of Teachers of English and was featured for sale at the 1992 NCTE Annual Convention.). 17. “Identifying Effective Writing Exercises for Lower-Division Technical Writing Courses.” Journal of Technical Writing and Communication 14 (1984): 307–316. (refereed). 18. “A Note on the Status of Lower-Division Technical Writing.” Technical Writing Teacher 11 (1984): 89–93. (refereed). 19. “Suggested Subjects of Composition for Lower-Division Technical Writing.” ERIC, 1983. ED 230 939.